When Jacob (Asa Butterfield) meets Emma (Ella Purnell), she takes him back in time to 1940 to an orphanage for "peculiar children." There, he meets children who have extraordinary gifts and peculiarities, including Millard (Cameron King), who is invisible; Bronwyn, who has incredible strength; and Claire, who has an extra mouth at the back of her head. When he’s introduced to Miss Peregrine (Eva Green), she says she's known of Jacob since he was born, because his grandfather once lived at the home. She explains that she and the children live in a time loop. Years earlier, during WWII, a Nazi bomb obliterated the home, so within the time loop, on the day that happened, the bomb doesn't hit. She tells him of the “hollowgasts” – creatures who want to harm the children. 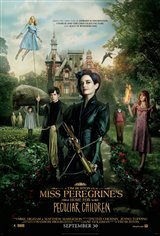 Although Jacob doesn’t think he has anything in common with the children who live there, Miss Peregrine, who’s also known as “The Bird,” tells him he was born to protect them and makes him promise to look after them when she’s gone. Based on the novel by Ransom Riggs.